Why hard turn–why not grind? 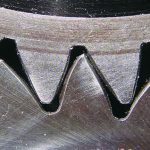 Why is a diaphragm chuck preferred over a standard three-jaw or pull-down chuck for gear turning? The two major advantages of a diaphragm chuck are accuracy and consistency of the clamping force. Since there are no sliding parts in the diaphragm chuck, the accuracy is directly related to the consistent elastic deformation of the diaphragm. This chuck relies completely on the diaphragm for opening and closing of the jaws. In a standard chuck there is a tolerance stack-up between the wedge, master jaws, and the chuck body. The centering accuracy of the diaphragm chuck is very important to gear clamping. The diaphragm chuck maintains the relationship between the pitch line of the tooth form and the machined center bore. The diaphragm creates another great advantage in maintaining consistent clamping force. The absence of sliding parts means that diaphragm chucks need no lubrication. Standard chucks gradually lose grip force between lubrications. The grip force for standard chucks is constantly changing, creating varying dynamic conditions. Diaphragm chucks eliminate this problem by relying on the elasticity of the diaphragm. How long will the diaphragm last? Clamping is based on the elastic deformation of the diaphragm. The diaphragm flexes with the “push and pull” that opens and clamps the jaws. There are no sliding parts in the actuation of this chuck, and minimal wear. This also eliminates the need for maintenance. 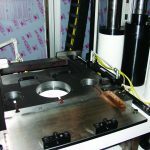 A special machining process is used to manufacture the diaphragm, which creates a very long service life for this component. The diaphragm will maintain a life of between 800,000 to 1 million actuations. Opening the chuck always places greater pressure on the diaphragm than does the closing force. The closing force is limited to the spring action of the diaphragm and prevents deformation of the workpiece. Clamping force may be increased and regulated by applying draw-pull from the hydraulic cylinder, as on a standard power chuck. What is the effect of quick-jaw-change on set-up time? The quick-jaw-change mechanism has the clamping jaws mounted on an ABS tool post. This provides a very rigid and safe jaw holding mechanism. This method of jaw change also allows for a very rapid and accurate jaw changeover, minimizing set-up time and lost production. The quick-jaw-change mechanism is actuated with one key. Counterclockwise rotation of five turns unlocks the jaw and allows for its removal. When the new jaw is inserted, clockwise rotation of the key locks the ABS and attaches the jaw to the counterbalance weights. 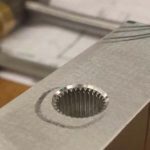 The jaw change mechanism is easily accessible when the chuck is mounted on a pick-up machine because the mechanism is located on the outside diameter of the chuck. The jaws can be changed in about one minute. 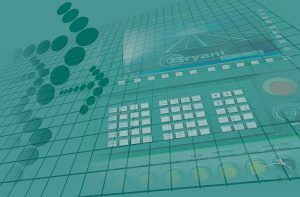 The jaws and the part locator can be changed in about three minutes. There is an initial set-up of the chuck required to “dial in” the jaws with a master gear. Once this is accomplished upon installation of the chuck it will never need to be repeated. One of the problems with diaphragm chucks in the past has always been the amount of time required to set-up new jaws whenever there is a part change. The DFR-ABS has eliminated all of this lost production time. Why actuate the chuck with an external cylinder? Most diaphragm chucks are self-contained front actuated, using a pneumatic cylinder for opening the chuck and releasing the workpiece. Clamping is accomplished by the spring action of the diaphragm. Among the features of the diaphragm chuck are relatively low gripping force and very small jaw movement. 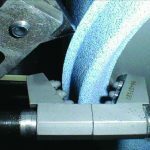 When using an external cylinder, it is a simple matter to apply a slight extra pull on the diaphragm to increase the gripping force when, for example, turning very hard materials where high tool forces are applied against the workpiece. This additional gripping force is not possible when using a self-contained chuck. 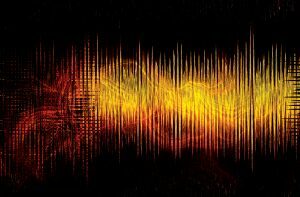 What types of media can pass through the chuck? The DFR-ABS chuck has the provision to allow either one or two media (air and coolant) to pass through the chuck. 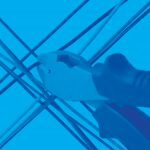 Air is commonly used as a part-sensing medium to ensure that the part is properly seated on the locator and clamped in position. When the gear comes in contact with the airflow hole, it stops the airflow, signaling that the gear is in the proper position. 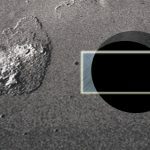 The second medium can be either air or coolant, to flush away chips and cool the machining process. The second medium generally comes through the spindle to a spray nozzle in the center of the part locator. What is the effect of centrifugal force compensation? Each DFR-ABS chuck is equipped with counterbalance weights to offset the loss of gripping force caused by centrifugal force. These weights are made from steel, and can be made from heavy metal in the case of large or heavy top jaws. The counterbalance weights are designed for each chuck to allow 100-percent centrifugal force compensation. This provides for a flat grip-force curve with no loss of gripping force, even at maximum rpm. 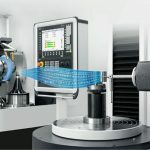 The practical benefit of this is that thin-wall parts can be gripped with a low force to avoid distortion, and the gripping force will remain constant through the machining cycle. 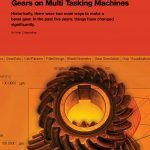 This eliminates the variation in dynamic forces that ultimately causes gears to be machined out of tolerance. How many jaw types are there? Type C jaws for pitchline clamping with clamping pins“Type A“ jaws are for outside clamping. 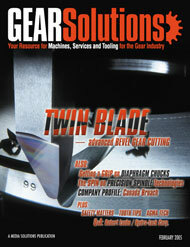 They use standard master jaws with hardened machinable inserts. The inserts can quickly be machined for new jobs and changeovers. 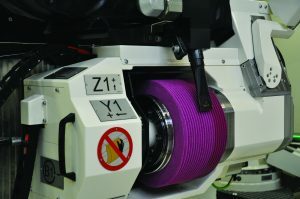 The jaws are provided with a set-up ring so the inserts can be turned to the proper diameter. Standard master jaws are maintained in stock at our factory. One set of master jaws can cover a range with different-sized inserts. Several sets of master jaws and inserts may be needed to cover a large range of OD clamping parts. “Type B“ jaws are designed with steel balls to clamp in the gear pitchline. The multiple rows of steel balls reduce deformation on thin wall parts by clamping in multiple tooth gaps. The multiple rows of steel balls tend to level out some of the tolerance of the gear serration. The ball cage and jaw insert are manufactured together to give the jaws very high rigidity. The reference diameter for the steel balls is turned on the insert for greatest accuracy. If the balls and insert begin to wear, they can both be replaced easily. 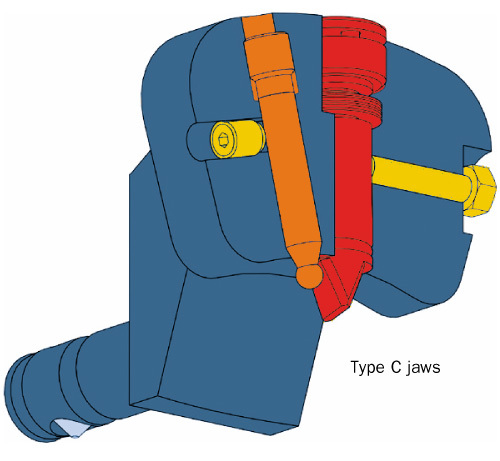 “Type C“ jaws are designed with a single clamping pin for clamping in the pitchline of the gear. This type of jaw offers the highest accuracy for clamping in finished gear teeth. The clamping pin is made from carbide for the greatest accuracy and durability. The clamping pin has a micrometer-fine adjustment so the jaws can be “dialed in” exactly on centerline with a master gear. There is a pre-locator pin in the “Type C” jaw to protect the clamping pin during part loading. The clamping pin is also allowed to pivot to offset the tolerance of the gear serration. Is a combination chuck available? Yes, and this chuck is referred to as the DFR-ABS KOMBI for its combination of both radial clamping jaws and axial clamping fingers. This is the solution for thin-wall gears with centering accomplished by the three jaws and clamping with the three pull-down fingers. 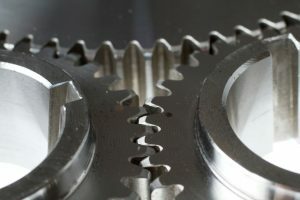 The jaws can then be opened during the machining cycle to minimize distortion on thin-wall gears. 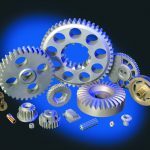 If the front face of the gear must be machined, that can be done with the jaws only. The clamping force is reduced and the fingers clamp on a machined surface. The KOMBI chuck is ideal for all types of thin-wall parts, not just gears. This chuck requires the use of a double piston cylinder for actuation. Why is this necessary for thin-walled parts? The KOMBI chuck gives the process flexibility when machining thin-walled parts. The double piston cylinder allows control of actuating the diaphragm independent of the clamping fingers. 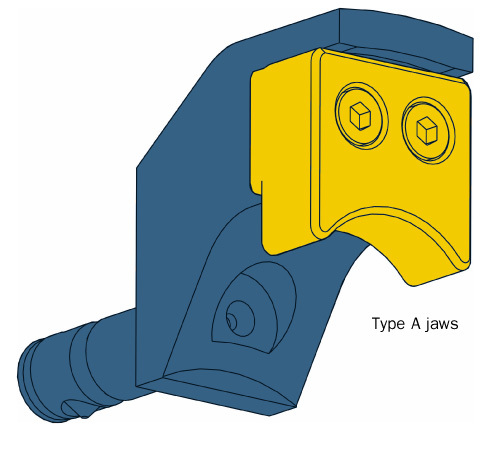 A typical process for clamping thin-wall parts is to clamp the part with the jaws to centralize the part. The second actuation with the cylinder clamps the face of the part with the three fingers. The jaws can then be opened before the machining begins. This process allows the part to be properly located, yet there is no radial clamping force on the part. This reduces the risk of deforming the bore of the part with radial clamping pressure. 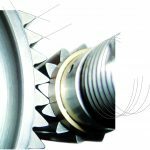 What about chip removal in hard-turning applications? 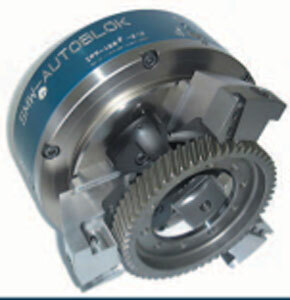 At SMW Autoblok, we have been using our quick-jaw-change chuck model KNCS-N for many green-turning applications. The KNCS-N is a wedge-bar chuck featuring an indirect drive of the master jaws rather than the direct drive found in wedge-hook chucks. This indirect drive brings the advantage of counter-centrifugal operation and high accuracy. Turning 7″ gear blanks on a KNCS-N chuck, we have achieved repeatability in the range of .0003″. Hard milling and hard grinding of the chuck body and internal parts facilitate a tight fit and high accuracy. The KNCS-N allows jaw change in less than one minute permitting rapid part changeover times. This chuck can be used for both external and internal gripping. 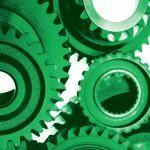 Standard “off the shelf” jaws allow for inexpensive solutions for green turning of gears. 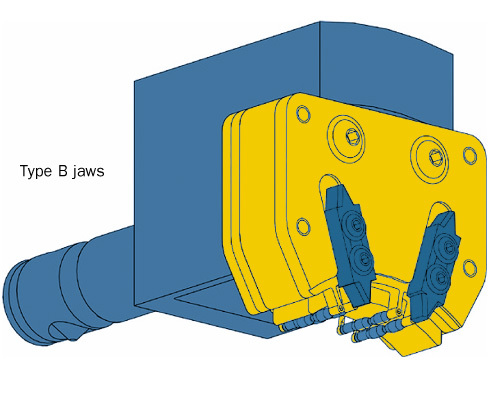 Claw type jaws are used for the first operation turning. The hard jaws are able to bite into the raw material to maintain a strong clamping situation. 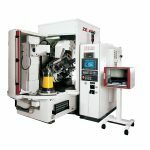 Since the KNCS is designed to allow an operator to radially move the master jaws in and out, typically the one set of claw jaws can machine a range of part claming diameters. Second operation clamps on the machine surfaces from first operation. The same chuck can be equipped with Monoblock style jaws that can be turned on the lathe. 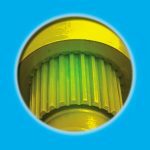 The single chuck design gives the versatility for completely machining the green turning operations. is president of the SMW Autoblok Corporation, which is based in Wheeling, Illinois. He can be reached at (847) 215-0591 or autoblok@smwautoblok.com. The company's Web site is [www.smwautoblok.com].